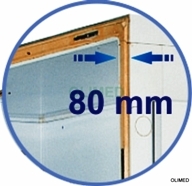 Olimed offers a range of cold rooms of over 200 standard models. The range consists of two lines: 80 and 100, within which you can select the most congenial per volume, size, temperature (0 ° C to + 8 ° -10 ° -25 ° C) with cooling unit (not included) built or prepared for the remote group. Extremely easy is their modularity, made ​​of modular panels with a thickness of 80 mm and 100 mm. The range includes cold rooms with interior volume from 1.84 to 36 m3. The finish both internally and externally is made of sheet galvanized plasticised white, suitable for food environments. The isolation of the modular panels is in high-density polyurethane without HCFCs. Assembly is fast with cam hooks. The floor is made of sheet coated with non-slip finish or stainless steel with rounded internal corners slip.